Dr Ralph Gonsalves is set to make history in St Vincent and the Grenadines as he starts a fourth term in office as Prime Minister. Having already completed fourteen years as Head of Government, within three years of the term to which he was elected on December 9, Gonsalves will overtake the record of former Prime Minister Sir James ‘Son’ Mitchell who served sixteen years from 1984 to 2000. Securing re-election to a fourth term as leader of a political party and Head of Government is no easy task as the closeness of the elections shows. Indeed, in many cases a leader and Prime Minister in office for fourteen years becomes a liability in general elections as the instinctive urge of the people, particularly younger voters, is for change. In this context, therefore, Gonsalves’ re-election is all the more significant. Clearly, the majority of the voting public regard him as the person in whose hands the stewardship of their affairs best resides. There are many reasons for the ULP’s victory over the NDP which has been headed by Arnhim Eustace since 2000, when Sir James Mitchell stepped down and virtually anointed him as leader. But, undoubtedly, the sheer force of Dr Gonsalves personality is a major factor in the country’s politics. He is charismatic; he regards himself as a man of the people, reflected in his insistence on being called ‘Comrade Ralph’; and he has a natural capacity for endearing himself to people of all classes, races and religions. Even his worst detractors have a grudging respect for his ability to charm. Beyond his interpersonal skills, Gonsalves is a hard worker who pays considerable attention to detail in the governance of the country. Despite a lack of sufficiently trained persons in the country’s public service, Gonsalves has managed the economy well. Inheriting an economy whose mainstay – the export of bananas – was severely weakened when preferential access to the European Union market was removed based on a World Trade Organisation (WTO) ruling, he has had to be inventive in maintaining employment and diversifying the economy. He also had to pursue aid and funding beyond the country’s traditional sources. There was much method in what seemed to be madness in seeking financial help from Libya under Muammar Gaddafi and from developing economic relations with Venezuela, under Hugo Chavez and Nicolas Maduro –these events cushioned the economy’s fall. Significantly, in establishing these new relations, Gonsalves did not alienate customary trade, economic and political links to the United States, Canada and the European Union. If anything, he displayed astute footwork in tip-toeing between the rain drops of contending foreign interests. A great deal of political capital both domestically and internationally has been invested in the construction of an International Airport in St Vincent. Completing this facility and making it economically viable will be a major challenge for Dr Gonsalves in his fourth term of office. The Airport is regarded as the key to opening-up the tourism potential of the main island, St Vincent, and further exploiting the already established allure of the Grenadines. However, operating it will be costly and its viability will depend on how quickly new hotels and resorts can be constructed to bring in an optimum number of airplanes and tourists. Since this Airport is Dr Gonsalves ‘child’ and will be part of his legacy, it is expected that the early part of his fourth term as Prime Minister will focus on making sure the tourism industry develops rapidly – a tough task given existing competition. Gonsalves, is also a man of scholarship. A review of his speeches and writings during his period as Prime Minister, reveals careful research and well-reasoned argument. He has seldom made public statements in the Caribbean and international spheres that serve a purely political purpose. The great majority of his speeches and writings has been erudite and persuasive. With regard to the Caribbean, he has been an unrelenting champion of integration, eschewing the fallacy that national insularity can bring success and debunking the notion that any country in the region has the capacity to bargain effectively on its own in the international community. In this regard, he ranks with the giants of Caribbean advocacy such as P J Patterson, Shridath Ramphal, William Demas, Alister McIntyre and Norman Girvan. As a sitting Prime Minister over the last fourteen years, he has shown remarkable courage – born of his credentials as a scholar and former University lecturer – in criticising his colleague Heads of Government for the slow pace of integration. And, he has been dogged in keeping alive the flame of Caribbean unity as the basis for advancing the collective interest of the Caribbean people. There have been other areas in which he has demonstrated a Caribbean commitment and a capacity for action that belies the smallness of his country. I well remember sitting with him in a coffee shop in St Vincent in 2012 when former West Indies fast bowler and then cricket commentator Ian Bishop passed by. 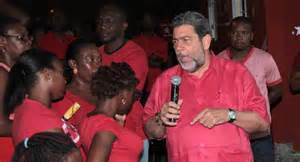 Gonsalves sent an aide to invite Bishop over and a conversation took place that led to negotiations with the West Indies Cricket Board, the recall of Chris Gayle to the West Indian cricket team and to Gayle’s flaying of England’s bowlers in the test series that year. Gonsalves is that kind of man. He acts intuitively and purposefully for the causes and principles in which he shares the care and pride of the Caribbean people. In this fourth term of office, a great deal of hope of the peoples of St Vincent and the Grenadines and the Caribbean reside in his unrelenting championship of their social, political and economic development. History can be made in more than the achievement of four terms in office. Dr Gonsalves knows that well.